"IT" CAN'T GET MUCH SCARIER!Become the talk and terror of the town in this Crimson Clown costume. This Boo! 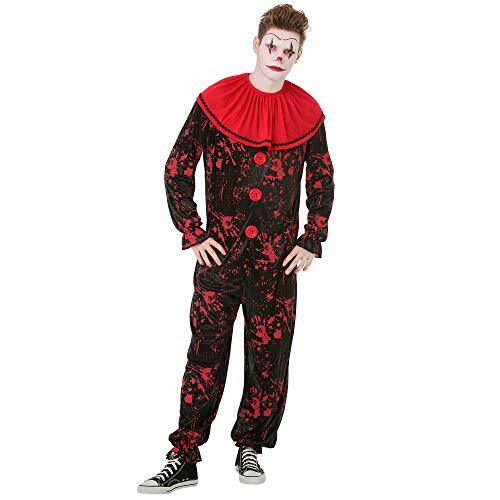 Inc. costume comes with the classic clown jumpsuit with a bloody twist; a unique crimson and black color palette with a bloody handprint style that'll have you up to all sorts of diabolical mischief and mayhem.Wear this to Halloween, theme parties, and costume contests. And when Halloween comes to an end, use it for role play, dress up, or cosplay. You're in for a spooktacular treat with this unique costume!What's creepier than a clown? 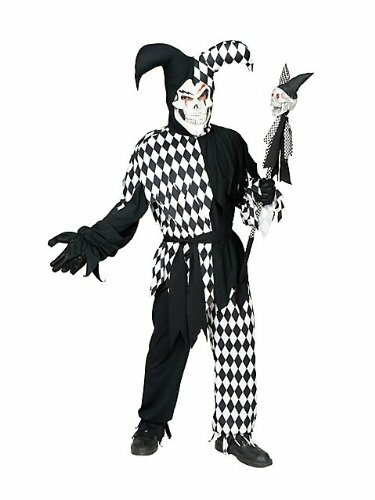 Call them jesters, comedians, pranksters, or a joker, no matter what you choose clowns are downright spooky characters!Handle With Scare:This men's costume was made with 100% polyester, no hocus pocus materials. Caught in a dark and stormy night? Hand wash your eerie outfit and hang it out to dry. To prevent colors from bleeding, avoid bleaching or ironing this attire. Follow the size chart for a scary good fit. Each adult evil jester costume includes a double-knit poy shirt, matching pants, black belt, jester headpiece and scary skull mask. 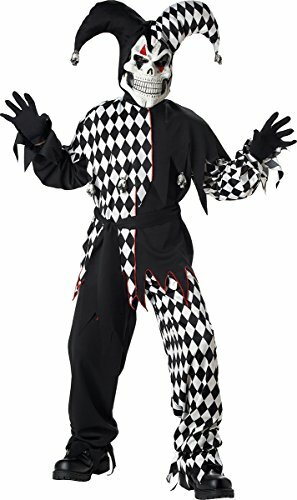 Choose this scary jester costume comes in black & red or black & white. Our evil jester costumes comes in adult sizes Large, Small, Plus Size 1X, Medium, Plus Size 3X, X-Large, X-Small. The jester scepter and black gloves are not included with this adult jester Halloween costume.